"Where has love got me? Where has gentleness got me? You know, violence has a kind of dignity in a loving man, and I'm full of love. I shall punish you with love. Now, where would you like love? Inbetween your eyes or your teeth?" Ever since I was old enough to go to the movies, David Warner has been one my favorite actors. As a child, I first saw him in works like Tron and Time Bandits,and as I got older, watching more and more films, I began to notice his habit of popping up in effective supporting roles in everything from The Omen to doing voices for cartoons and video games. Unfortunately, many of the films he's been in aren't very good; often downright terrible, straight-to-video productions of embarrassing proportions. Warner, like a trooper, does his best in each role, though. 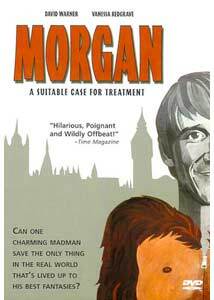 Despite his lengthy career, he's only had one, true starring role, and that was in the 1966 film, Morgan: A Suitable Case For Treatment. Interestingly, it was one of his first films and also showcased the early talents of actress Vanessa Redgrave. Thankfully, for his only major starring appearance, Morgan is a satisfying and completely bizarre experience into which Mr. Warner fits very well. Morgan (Warner) is a rather strange man who's been raised as a Communist, fantasizes about being a gorilla, and lives in a car. Despite being crazy in the literal sense, he's escaped being institutionalized, thanks to the kindness of strangers. He's married to Leonie (Redgrave), who's his perfect match because she's not quite all there, either. The problem is, she's changed her mind and no longer wants to be married to Morgan. Instead, she'd prefer to live with Charles Napier (Robert Stephens), a wealthy art gallery owner who, though once friendly with Morgan, doesn't mind moving in on his life. Morgan, very miffed at the whole situation, takes up residence outside his former home and continuously harasses Leonie until she realizes the error of her ways. Along the way, he also tries to kill Charles and other members of Leonie's family. He figures it's all in a day's work. Although Morgan qualifies as a romantic comedy, it's a pretty unusual one. Each of the three people in this triangle are equally crazy, sometimes disturbingly so. None of them seem remotely worthy of love or attention, really, but I guess that's not supposed to be the point. Actually, it reminded me of Benny and Joon, without all the internal messages about being mentally ill and how "anything is possible" with fantasy and love. Instead, Morgan is actually quite grim at times, showcasing people who really would be better off in a hospital somewhere, or certainly separated from each other. That's the key, however, to what makes it funny. The director doesn't take the story and turn into some moral lesson about how all relationships should be crazy like this; if anything, he keeps the audience at a certain distance from the material, which is nice. The excellence of the performers and these relentlessly insane characters make Morgan entertaining from beginning to end. In fact, it moves pretty fast and never really dwells on one thing for too long; more like a series of scenes, each of which has Morgan trying another way to handle or defeat his problems. The key problem with Morgan for most people will be the fact that there's really no underlying message. Most romantic comedies have a specific resolution; the guy gets the girl (or vice-versa) or he doesn't and learns a special lesson along the way. Here, though, there's a very vague, discomforting feeling about the romance going on, at least there was for me. Its future is undetermined and, to be honest, I preferred that kind of approach rather than the typical romantic angle. Image Transfer Review: The black & white image is nicely rendered and, despite the age of the film, free of major defects. While there is some heavy grain, a few scratches, and reel-change marks, the transfer manages to preserve a solid, well-detailed film without compression issues. Anamorphic enhancement has obviously benefited the transfer by adding a certain amount of depth. Occasional background pixel movement is present, but only in scenes with extremely dark and/or hazy textures. Overall, a pleasing disc that doesn't get in the way of the movie. Audio Transfer Review: The age of the film has taken some toll on the audio elements; there are some pops and tape hiss in many areas, but there's little to complain about. The musical score is of surprisingly quality, and dialogue is never hard to understand (except where that was the intention). Extras Review: The disc contains the original trailer (nonanamorphic), but no other features. There's adecent number of chapter stops and the presention is good quality. The keepcase insert is acardstock replica of one of the original posters for the release. Morgan received a variety of awards and acclaim upon release and, frankly, that surprises me. Not because it's a bad movie, but because it's so strange and non-mainstream, even for the 1960s. It succeeds in being an enjoyable romantic comedy without being a romantic comedy, if you get my meaning. It also showcases some fine acting, especially David Warner's manic energy. This is easily part of the pantheon of great, incredibly weird, British comedies.